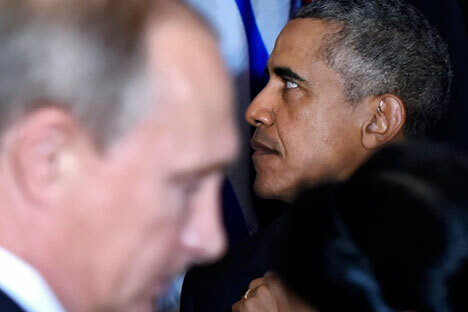 The meeting between Vladimir Putin and Barack Obama during the 70th session of the UN General Assembly has left the main disputed issues raised by the sides unresolved. RBTH presents a list of the principal points that impede the two sides from cooperating in the fight against ISIS. This is the main point of contention. There is the impression that for the U.S. removing Syrian leader Bashar al-Assad from power is more important than combating ISIS. Too much political capital and too many propaganda resources have already been spent, first on the fight against Hafez al-Assad and then his son Bashar al-Assad. For America, taking back its demands would mean admitting a mistake and demonstrating weakness. This is why the U.S. is gambling on the secular opposition and is refusing to cooperate with Bashar al-Assad, whom Obama has officially branded as "a tyrant." The Americans insist that the Syrian president should step down and then the opposition groups will unite with the remains of the army and continue the fight against the Islamist extremists. During his address to the UN Obama declared, "We must recognize that there cannot be, after so much bloodshed, so much carnage, a return to the pre-war status quo." Russia, on the other hand, insists that only Assad can be the legitimate leader of Syria, that currently there is no one who can replace him and that it is his army that is truly fighting ISIS. "We should finally acknowledge that no one but President Assad's armed forces and the Kurdish militia are truly fighting 'Islamic State' and other terrorist organizations in Syria," Putin said. However, Moscow does not idealize Assad and acknowledges that Syria needs political reforms, although without intervention from abroad. The Kremlin advocates a pragmatic approach: first defeating ISIS, then having the Syrian government negotiate with the opposition. "We are ready to talk with Assad so that he cooperates with representatives of the moderate opposition and carries out political reforms," explained Putin at the St. Petersburg International Economic Forum in June. Moscow has made it clear that it is ready to join the U.S.-led anti-jihadist coalition but demands that it first receive a UN mandate. "First of all we propose discussing the possibility of passing a resolution on the coordination of all forces that oppose ISIS and other terrorist groups. I repeat, such a coordination must be based on the principles of the UN Charter," said Putin from the UN General Assembly podium in New York on Sept. 28. This is needed in order to clearly formulate the "rules of the game" and avoid repeating the Libyan scenario, when under the pretext of protecting the civilian population the West bombed Libyan territory and basically ensured Libyan dictator Muammar Gaddafi´s removal. The Kremlin needs a UN Security Council resolution where the goals of the international coalition and the means of fighting ISIS will be defined. "Indeed we want to create a certain international coalition to fight terrorism and extremism and it is with this aim that we are consulting our American partners," said Putin in New York. Moscow is making efforts to attract Iran to the fight against ISIS and to the resolution of the Syrian crisis. However, the Persian Gulf monarchies allied with the U.S. oppose this, primarily Saudi Arabia and Qatar, for whom Iran is a competitor for dominance over the region. Actually, the recent developments in the Syrian crisis are in many ways a consequence of the Iranian-Saudi confrontation: Tehran assists Assad, while the jihadists receive financial aid from the Gulf countries. "I'm getting the impression that someone wants to use ISIS's separate units or ISIS as a whole to ‘remove’ Assad and only afterwards think of how to deal with ISIS," said Putin in an interview with journalist Charlie Rose for the American TV channels CBS and PBS. The agreement signed in July on the Iranian nuclear program should transform Iran from an international rogue state, in the eyes of western nations, to a completely acceptable negotiating partner. Obama said that, "The United States is prepared to work with any nation, including Russia and Iran, to resolve the conflict." The problem consists in the question of whether the Arabian monarchies will want to search for a compromise with Tehran. For now there are two de-facto competing anti-jihadist coalitions active in the region: The first is under the aegis of the U.S. and Saudi Arabia and the second includes Russia, Iraq, Iran and the Assad government. The presidential race has begun in the U.S. One of the things that the Democrats have been accused of is an indecisive foreign policy. It is important for Barack Obama to be firm and resolute, especially in relation to Russia, which the American mass media is depicting as the new "empire of evil." For Putin a possible victory in the fight against ISIS means demonstrating to the Russian people that their leader is decisive and can return the status of a great power to the country.